French helmet and cuirass, comprising composite and associated close helmet, breastplate, backplate and culet. The helmet and cuirass are decorated with etching in relief. The embossed ribs, which are roped by the etching, separate bands of pendent military trophies from bands of similar trophies alternating with stylised plants bearing daisy-like flowers with between four and eight petals each, all on a dotted ground. Particularly in those bands which contain plants much of the decoration is outlined in relief. The trophies include close helmets, their visors raised to reveal the wearer’s face, and contemporary and classical cuirasses. At the top of the bands without plants are artillery trophies, including cannon mounted on field carriages, some with the piece powdered with fleurs-de-lis and crowned Hs. At the top of the central band of the breastplate is a figure of a man in classical dress seated under a baldachin holding a laurel spray in his right hand and a lance in his left. In the same position on the backplate is a figure of a seated woman. The narrow edging-bands of the plates are etched with running scrolls of foliage with trilobate leaves, all on a diagonally hatched ground. This type of decoration has been described as 'glorious motifs' (aux motifs glorieux) and its appearance dated from 1580 to 1610. The fleur-de-lis and crowned ‘H’ on the guns indicate a date within the reign of Henri IV of France and Navarre (r. 1589–1610), while the individual trophies forming part of the decoration of these pieces are very close but not identical to those published by Hans Vredeman de Vries (1527-c.1607) in 1572. A recent re-examination of the helmet has shown it to be composed of several disparate elements of the early seventeenth century that have in relatively recent times been adapted to one another and decorated to match the authentic cuirass. The rear gorget-plate and upper bevor are entirely restored. The decoration of the helmet does not include cannon bearing the crowned ‘H’ cipher, such as occur within the decoration of the cuirass. Consideration should therefore perhaps be given to the possibility that a helmet in the Metropolitan Museum of Art, New York (acc. no. 14.25.618), which bears the same kind of decoration as the cuirass, might in fact be that which originally belonged to it. Measurements: Helmet: height 31.9 cm, width 25.0 cm, depth 35.5 cm; Breastplate: height 47.2 cm, width beneath arm-openings 35.9 cm, width at waist 29.6 cm; Backplate: height without culet-lame 43.7 cm, width beneath arm-openings 33.1 cm, width at waist 26.0 cm; Culet-Lame: height 9.9 cm, width 36.3 cm. 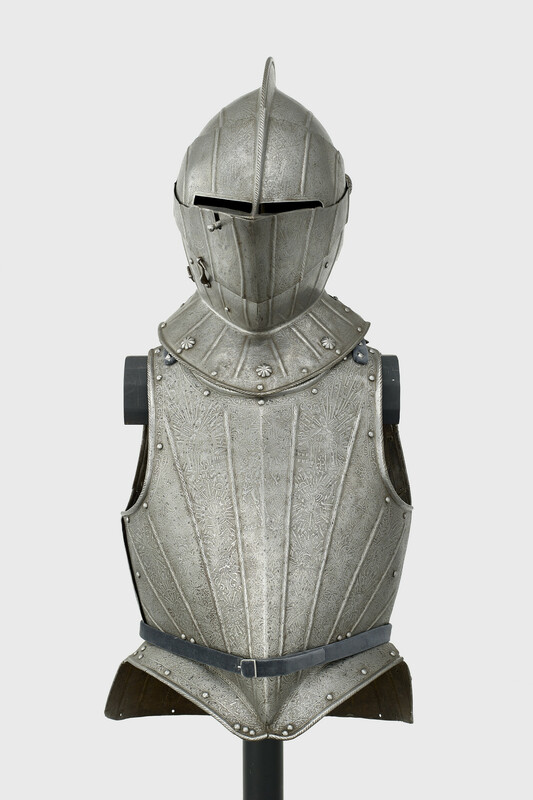 Weights: Helmet: 2.310 kg; Breastplate: 1.260 kg; Backplate and Culet-Lame: 1.720 kg. Tests undertaken by Dr Alan R. Williams show both the cuirass and its associated close helmet to be formed of mild steels with overall carbon contents of about 0.1% to 0.2%. That of the breastplate, though consisting mainly of pure iron, includes a band in which the iron is mixed with a little carburised iron (pearlite). It contains some slag-inclusions, including a row of elongated ones indicative of hot-working. The matching backplate, with a microhardness in the range 163–172 VPH (average 168 VPH), is formed of a mixture of ferrite and a little carburised iron containing numerous slag-inclusions. The skull of the composite and partly restored close helmet is formed of a very uniform mixture of pure iron and a carburised iron with a highly fragmented microstructure. It has a few slag-inclusions that show evidence of having undergone a good deal of hot-working.